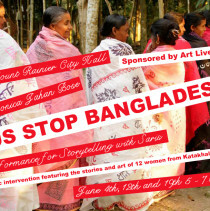 For Immediate Release from Art Lives Here: BUS STOP BANGLADESH is a three-part public intervention held on June 4th, 12th, and 19th from 5 to 7:30 pm outside the bus stop at Mt. 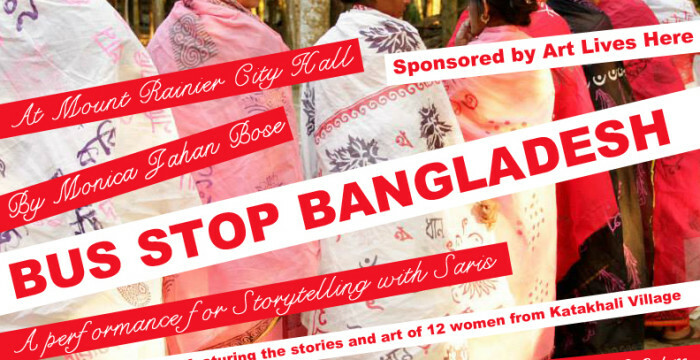 Rainier City Hall featuring the stories and art of 12 women from Katakhali Village, Bangladesh, an island community adversely affected by climate change, presented by artist/activist Monica Jahan Bose, and sponsored by Art Lives Here. Through performance and installation, Monica Jahan Bose will bring the art and stories of a dozen women from a remote Bangladeshi island to Mt. Rainier. The intervention will each day display four saris created with woodblock and hand-painted words and images by the women of Katakhali Village, Bangladesh, as part of Storytelling with Saris, a collaborative printmaking and story project which highlights the achievement of literacy by women of Katakhali. These saris will hang from Mt. Rainer City Hall, visually representing the story of each woman’s achievements and courage in rebuilding her life, learning to read, and surviving successive cyclones and other effects of climate change.